It was a good story while it lasted. Over the past few years, the BC government and many in the policy community have spun a tale about the remarkable success of BC’s climate action policies, with a big spotlight on the carbon tax as a driver of lower emissions while BC’s economy outperformed the rest of the country. In BC’s case, the carbon tax was announced in the February 2008 “green” budget, and implemented in July (starting at $10 per tonne, with annual $5 increments to the current $30 per tonne, in place since July 2012). Because of time lags, only a few years of data were available when judgements about BC’s climate action success began to roll out. With Canada’s new National Inventory Report (NIR), we now have data up to 2013, and it’s not a pretty story for BC (Part 3, Table A10-20). In the supposed era of climate action, the trend for BC’s emissions is moving in the wrong direction. Emissions have been rising every year since 2010, and as of 2013 are up 4.3% above 2010 levels. Moreover, if you look closely at the underlying table, the rise is almost entirely explained by the growth of the natural gas industry. On the bright side, however, BC’s emissions are down 2.5% relative to 2005 levels, and 3.2% since 2000. Unfortunately, the new NIR table does not fill in all of the years in-between, and astute observers would note that BC’s base year for its legislated GHG reduction targets is 2007. The new national report adopted changes in measurement to reflect the latest climate science (Part 1, Chapter 8), so we cannot use previously published numbers from the BC government. BC has more detailed data available online but the next update won’t happen until mid-2016, so their data only go to 2012. The older numbers show that emissions were already falling by the time BC’s 2008 green budget and carbon tax came into play. The data show no change from 2007 to 2008, but a notable 4.6% drop from 2008 to 2009, which accounts for essentially all of the claim of emission reductions. I suspect, however, that this is better explained by the financial crisis in Fall 2008 and subsequent recession than by the carbon tax. Why? As mid-2008, BC’s shiny new carbon tax added only 2.3 cents per litre at the gas pump, while prices were already north of $1.40 per litre. Those high prices were driven by market forces but also by other taxes. You often hear that Canada has “no price on carbon” but fuel taxes are just carbon taxes with a smaller tax base. Indeed, BC’s motor fuel taxes are substantially larger than the carbon tax then or since, with a general rate of 14.5 cents per litre of gasoline and up to 25.5 cents per litre in Metro Vancouver. The federal excise tax on gasoline of 10 cents per litre, plus GST on the purchase price, is also larger than the carbon tax, even at today’s 6.67 cents per litre equivalent ($30 per tonne). 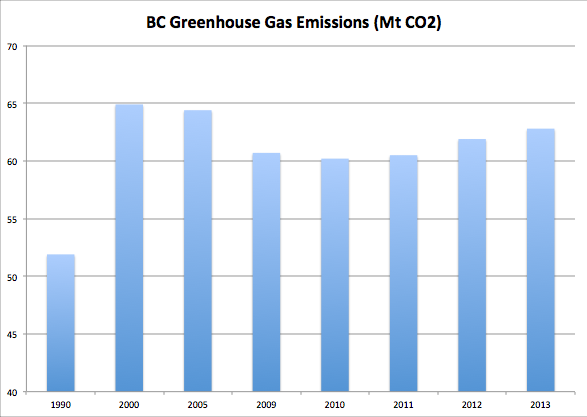 The BC government makes the dubious claim that they met their interim GHG reduction target for 2012 of 6% below 2007 levels. Even then, BC’s numbers showed only a 4.4% drop, which as noted, there is a one-time drop from 2008 to 2009 that is at play. The claim of 6% reduction is based on the purchase of bogus carbon credits (or offsets). This is more fiction than fact: there is no detailed reporting on how offsets were used, especially amid an offset regime that has massive credibility problems after a scathing Auditor-General’s report in 2013. Stripping out the bogus offsets, in national terms BC’s performance is nothing special. Going back to the new NIR data, BC’s slight drop in emissions since 2005 (2.5%) is similar to Canada as a whole (down 3.1%). Also like BC, Canada’s emissions have been growing since 2009 (up 3.9%). BC has fared better than Alberta, whose emissions shot up 14% since 2005, but Canada’s true climate leaders are Quebec (down 8.4%) and especially Ontario (down 19%), which is phasing out coal-fired electricity generation. OK, what about the storyline that, in spite of the new carbon tax BC’s economy has outperformed the rest of the country. From 2008 to 2013, BC’s economy grew 12.6%, while Canada’s grew 15.1%; from 2010 to 2013, BC 11.5% to the national 13.9%; and even just 2013, BC 3.2% to Canada 3.4% (all from CANSIM Table 384-0038). If we go to constant dollars, there is a very slight edge to BC over Canada, but it works out to 0.07% per year in GDP growth rates. So BC can claim that the carbon tax has not lead to weaker economic performance than Canada as a whole. But that’s not saying much because the carbon tax is still too small to be very effective. Even less so with current oil prices – it would take an additional carbon tax above $200 per tonne just to get prices at the pump back to where they were a year ago. Bottom line: BC’s emissions are on the rise. We need to stop telling fairy tales about BC’s climate action policies and its carbon tax (and I say this as a general supporter of carbon taxes). BC’s proposed “climate action 2.0” is wishful thinking; so far all we have is the intention to create a committee to propose further actions. Meanwhile, we cannot ignore the inconvenient truth about BC’s ambition to launch a massive Liquefied Natural Gas industry. If realized, these plans would put into the atmosphere some 200-300 million tonnes of carbon dioxide equivalent per year (4-5 times BC’s own annual emissions in 2013). This carbon is currently safely sequestered underground in deep shale formations, and climate action demands it stay that way. The bulk of those emissions would count in the importing country’s (Japan or China) emissions inventory, not BC’s. But even the smaller amount of emissions in BC that do get counted (associated with fracking, processing, and getting product onto those LNG tankers) would make it impossible for the province to meet its legislated targets.